According to Forbes, web design trends are leaning towards engaging photographic content that combines bold yet minimal graphics with interactive content. A personalized, entertaining, and polished web application is a must going forward as end-users are looking for non-generic websites that are easy to understand and use. With this said, web developers, whether they are new to website design or not, are looking for platforms that offer easy-to-build websites that provide just that, without necessarily forking out a considerable amount of money for themes, plugins, and overall development. This is where Mobirise comes in, a user-friendly website maker originating out of the Netherlands. It is marketed as a drag-and-drop builder that can be used to create all kinds of web pages from landing pages to portfolios, to small and medium-sized business websites. How Do You Use Mobirise? Using Mobirise is incredibly easy, even for those who know nothing about website development, design, or building in general. It is a free download from the Mobirise website and is available on both Windows and Mac computers. It is as simple as downloading the website creator application and then launching it from your computer. Once you have loaded the mobile website builder application up, it’s as simple as clicking “Click Here to Start” which allows you to see all of the blocks available. These blocks are used to build your website by finding one that you like and dragging and dropping it into the position you want. You can view all of the blocks or you can filter them by theme, extensions or specific user-saved choices. In order to get started on your site, you click the “three-line” menu in the top left of the mobile website builder application and click My Site to create, open or rename a site. Once you’ve created a new site, you can get started on choosing the theme, the extensions you want and the blocks you would like included. If you add a block in and want to move its position, click and drag it up or down within the Mobirise Mobile-friendly Website Builder. If you add a block in that you no longer want, you just hover over the top right corner of the block and click the little trash can. If you want to edit the block, it’s as simple as hitting the cog will on the block from the top right corner. You can change the background image, color, video as well as the overlay color, opacity, buttons, description, titles, and text. If you want to edit any of the buttons or text right on the block, it’s as simple as clicking on them and using the editing toolbar that pops up. Once you are done designing your website, you click the publish button and export it to where you would like. Options include your local drive, your server via FTP or even to Github. 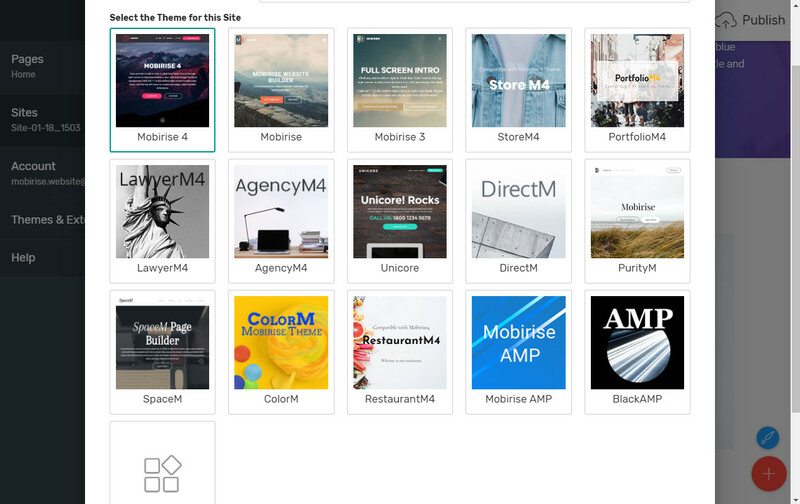 What makes Mobirise Mobile-friendly Website Builder so unique is that it comes with over six hundred website blocks that are collective to several different themes. These blocks are pre-made but you can mix and match them as you need. For instance, there are galleries, timelines, accordion toggles, sliders, counters, full-screen introductions, video introductions, progress bars, forms, social blocks, testimonials, footers, pricing tables, data tables and more. 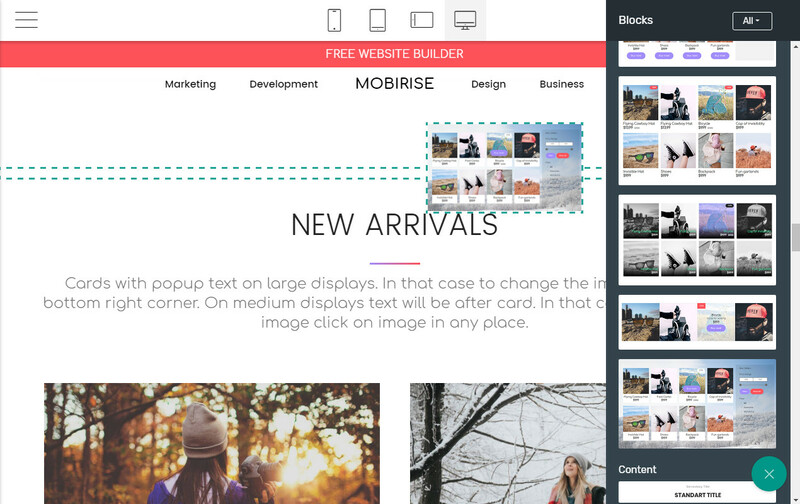 This means that you can combine article blocks with sliders, add in a gallery below and show off a feature block. No matter what your website is about, there will be a block that can support what you want to do. Plus, all of the themes are mobile-friendly and mobile-responsive, with no added work on your end. To give a few examples, the galleries include tags and captures and the video sliders have retina-ready images. The pricing tables come with gradient backgrounds, and the introductions come with changeable overlays, animations, video backgrounds, and forms. 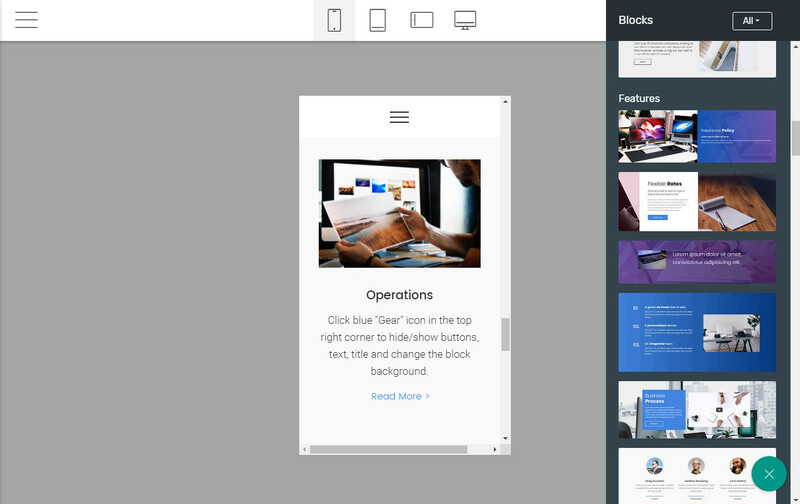 The feature blocks will have cards that can contain text, images, icons and buttons and the article blocks will have editable titles, images, buttons, and content blocks. In terms of extensions and plugins, there is a ton of customization. From adding in PayPal shopping carts to social feeds to Google Analytics, icons, and the ever famous WOW Slider. There are some paid packages for extensions which provide more theme templates of varying designs. For instance, you can buy a portfolio theme which is great for freelancers and designers, or go with a romantic and subtle theme called Purity. Once your website is published, editing it is easy. After you’ve gone in and made the changes you want, it’s as easy as hitting the upload button. This will publish the changes immediately on the server your website is hosted on. To put it simply, the free website builder application is an offline application so you can make your changes anywhere even without an internet connection. It’s also free with paid modules, meaning you can create a gorgeous website without needing to spend any money on the themes, extensions, or the development. It’s also incredibly simple to use, it comes with responsive templates and it is ideal for those who are new to website design. In terms of cons, setting up a domain and your own hosting might be a bit of a pain. 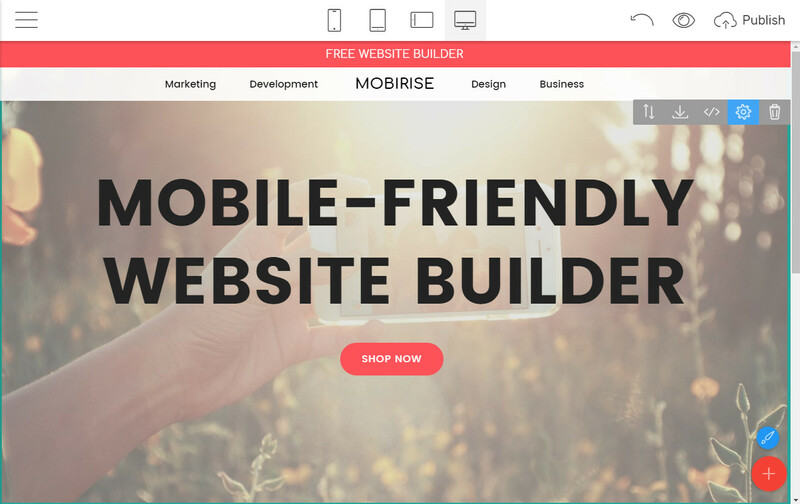 If you are new to website building, this can be the confusing process but once you’ve figured it out, uploading your website is very simple from the Mobirise Mobile-friendly Website Builder. The only other downside is that the website templates/designs all look and feel familiar to one another but that’s just because of how the templates stack on top of one another. 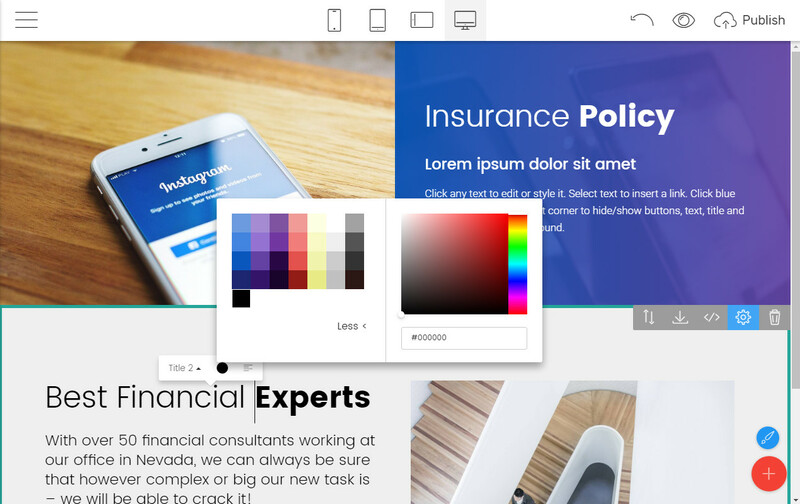 You can still build a completely unique website from anything else on the web with Mobirise Mobile-friendly Website Builder. Overall, Mobirise is an intuitive, responsive and high-quality website builder that is easy to understand and get started on. For the number of templates and themes available to the huge amount of customization that can be played with, there is no reason to not try the platform out, especially if you are looking to make small to medium-sized websites that are mobile friendly. Download Mobile-friendly Website Builder Now!